meghan’s belle on ravelry here. those buttons look super cute. i know i’ve been showing all the handspun belles on here, and with good reason – they are gorgeous and there was also this deal… but many people make these out of fibers other than handspun. you can see some of them here on ravelry – encore, hand dyed wool, artyarns supermerino, sugar ‘n’ cream etc. etc. check them out. 4) more hats! esp. fleshing out the baby and kids hat selection and 2 slouchy adult hats at least. maybe bonnets. definitely more snow bunnies. we’ll see what i get done. 5) clean the yarn room a bit so we can play with the drum carder and then i can spin that too. next fairs are the 12th and 13th. 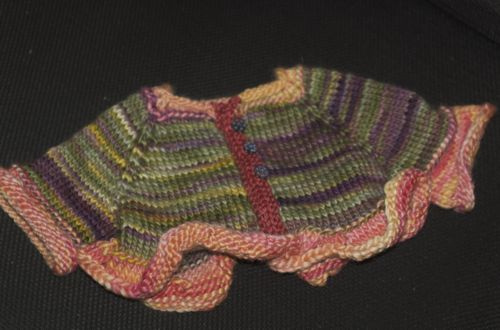 This entry was posted in baby, community, cosyknitsliterally, cosyspins, knitting, patterns, spinning, sweaters by cosymakes. Bookmark the permalink. Looks like a fun fiber list. Hopefully, other stuff won’t interfere too much.